Away is a fantastical portrait of a young man, whose striking features outlined in broad and loose strokes, staring at viewers unflinchingly. 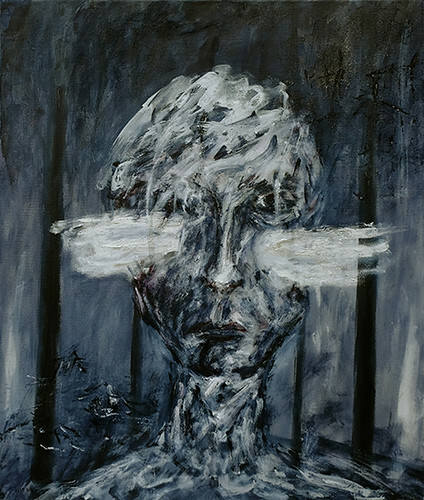 Lifting the portrait beyond realism realm were two white patches hovering just below the sitter’s eyes, as if two small wings had grew out of his deep thoughts and were ready to bear him away, from the confinement of the tight space allotted to him, from the heavy vertical bars on both sides, and from the ruined bridge and houses on the corners of top right and lower left, respectively, testaments of some traumatic past. 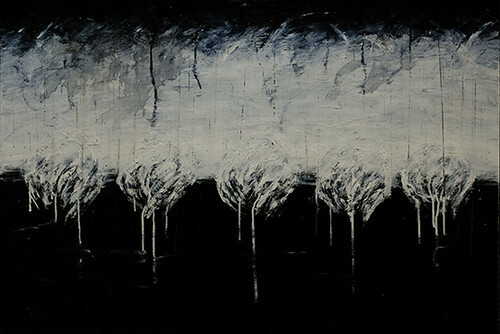 A landscape as an enigma is the impression of my monochromatic oil painting, Interlocked, which depicts a semi-abstract, difficult to decipher landscape, under the threat of heavy and broadly zigzagged clouds in the upper region, while underneath, an orderly and calm swatch of staggered and slightly angled roofs, indicates order, and furthermore, social hierarchy and constraints. The dripping liquids permeating the landscape lends the notion of connectedness and the interlocking nature of the environment, natural or man-made. 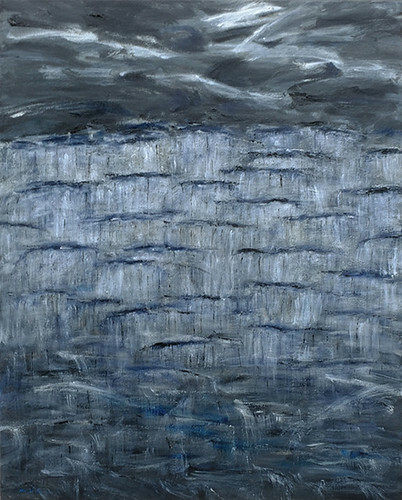 A horizontal canvas divided into two zones, upper part is a white space being invaded by dark clouds from top, while the lower half uniformly dark. Connecting and separating these two spaces are five slightly wilting white flowers, caught in the no man’s land between these contrasting zones, with some of these flowers disintegrating and dipping further into the innermost of the dark space, like invading roots grew into hidden soil. This highly contrasting painting, C Major, depicts a world which was both harmonious and polarized, and the little exchange of these two worlds simultaneously terrifies and entices. Additional layers of lines, spots, and scratch marks, give the painting a patina of an aged photograph. C major, one of the most common key signatures used in western music, was often the key for many Masses and settings of Te Deum in the Classical era, such as works by Haydn and Mozart. Without flats and sharps, C Major perfectly encapsulates the seemingly absolute separation of order and chaos. Though a bit dated and fading, like an old family album, we still yearn for it, for its orderliness and predictability, which seems forever beyond reach; in today’s world, no matter which key dominates, dissonance persists. 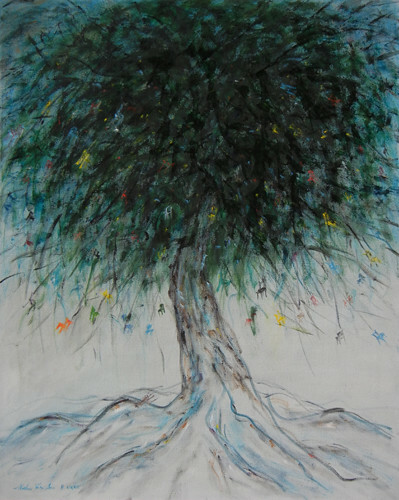 A giant verdant tree, erect on its strong and knobbly roots, full of colorful chairs hanging from its riotously wide-spreading branches, is quite a heartwarming congregation. Warm and deep colors intertwined with shades cool and pale, helps to create modulating and shifting moods. Despite joyous colors of those chairs, their positions are somewhat precarious, manifested in a lone chair underneath the seemingly carefree gathering, clinging to the roots of the tree — knocked down, a fallen one, or a cast out one? It would be up to viewers to interpret. Apropos viewer’s perception, I was also somewhat surprised to hear from a friend on how disturbing the painting was. Those swinging chairs, somewhat called more disturbing images to his mind — hanging bodies swinging in high branches, echoing those from war times documented by Goya, or from not so distant periods of concentrated lynching, whose records were fading fast from our collective memory. This linkage to the darkness was so serendipitous, that even I needed such illumination. Apparently, my intention, combining with viewers’ interpretation, could have generated much more interesting dialogue, thus create another form of congregation. The monotonous grayness of the cold climate landscape, though off-putting to some, holds special attraction for me, perhaps, nostalgia is the root of such attachment. I love the blanketing quietness stealthily imposed upon the environment, and appreciate the occasional higher values (not necessarily more vibrant colors) which enliven the space rhythmically and musically. 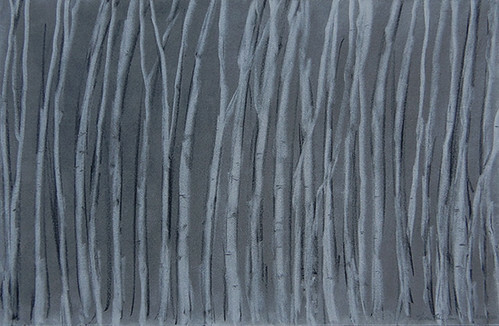 My charcoal drawing Formation is such a presentation of the cool, unyielding, yet not totally unfriendly northern place which tenderly and harshly nurtured my growth. Almost puritanical, yet beautiful in its heart-rending austere bleakness. A vision serendipitously visited me, and my subsequent partially-successful effort to capture it, resulted in a sparse and drawing like oil painting, Birches. The vision I pursued was a field of blurry birch woods, with the outlines of those slender white trunks emerging and disappearing constantly into darker background, as if the constant ripples of a vast waterbody. 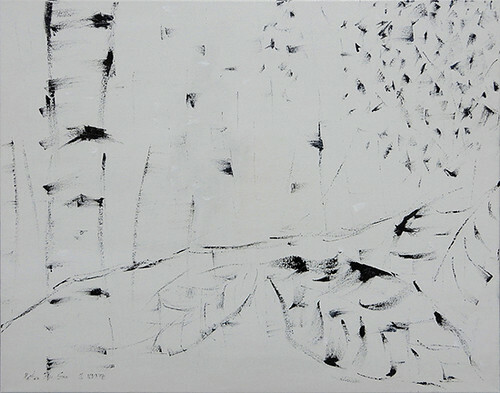 My final painting looked almost like the negative of that vision – bright serene background, on which floated silhouettes of several birch trunks, branches, and leaves, isolated or in clusters, in panoramic view, or zoomed-in detail. When artists strive to make things new, we can not and should not completely remove ourselves from the past or tradition. Often, the sediments of the past lend more meanings and poignancy to our new endeavors, or our new interpretations. 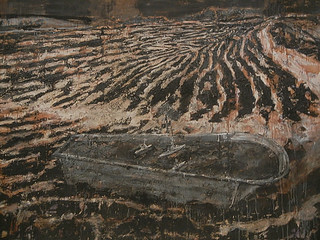 One of the greatest living artists Anselm Kiefer, is such an example who is steeped in tradition, and I was often moved by the historical resonances he brought forth to his monumental paintings, often through motifs connecting the past to the present, or the future. 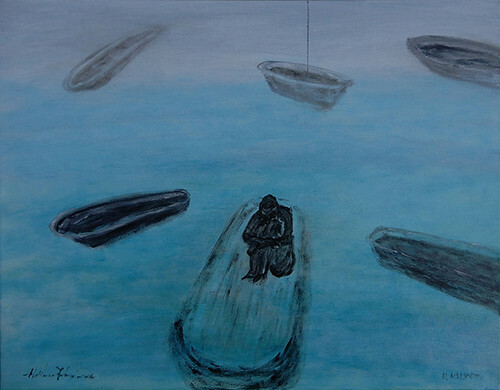 One of his striking paintings can be seen in SFMOMA, Unternehmen Seelöwe (Operation Sea Lion), placed a tin bathtub in a desolate field, containing several battleships. According to a curator, the manufacturer of those domestic bathtubs, was also manufacturer of weapons used in WWII by the Nazi armies. Such deft reference was a master stroke of Kiefer’s. 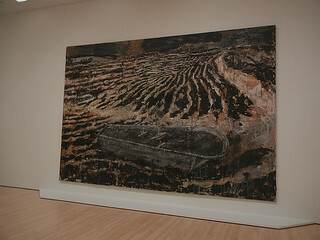 That painting, particularly its intriguing bathtub, left a strong impression on me, and it compelled me to record my understanding and imagination grew out of Kiefer’s motif, and led to a painting which I simply named as Anselm Kiefer’s Bathtubs, which was populated with several of such bathtubs in various planes and angles, as if floating on an open sea or in the space. Inside the central tub, a lonely-looking naked man hunched over and hugged his knees. The occupied bathtub, though surrounded by its “peers”, who were obviously in disagreement with one another, and rendered its lone occupier quite isolated and vulnerable. Such painting is also my tribute to a leading artist of our time. 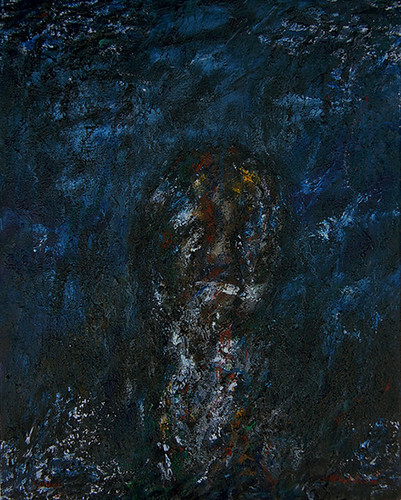 My recent painting Modern Man is a portrait of a faceless man (or a woman) — dark, brooding, and quite uncertain — who symbolizes the anxiety-ridden man or woman of our uneasy and quite dangerous time, who’s willingly or unwillingly blind, and can only stumble along in the deep fog from which he or she could never escape. The world is a trap. 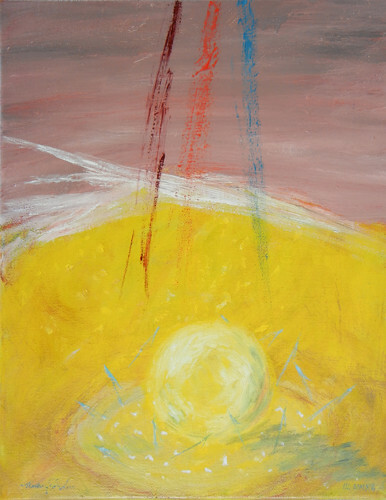 One of my attempts to capture fleeting impressions of well-known Greek mythologies resulted in an abstract painting Paris and Three Goddesses, whose pink and golden color blocks in the background signified the dangerous intermingle of the mortal and immortal worlds. Three powerful goddesses, Hera, Athena and Aphrodite, were represented by three richly colored powerful beams, which penetrated the human world below, while circling like sharks of their prey a small globe — the golden apple, to be awarded to the most beautiful one, planted by the spurned goddess of discord. Poor Paris, represented by the golden color associated with another golden male beauty Apollo, was pinned down by those powerful beams above, and responded with blue sparks, echoing the beam of Aphrodite alone, risking the wrath of Hera and Athena, for the sake of the most beautiful woman on earth, the Queen of Spartan Helen, the promised bribery from goddess of love, and eventually launched thousand ships and unleashed the ten-year Greco-Trojan war, and caused unspeakable misery for many, many more. Little ones are perennial pitiful playthings of the powerful ones. This painting is currently in a Group exhibition Color Speaks (Sep. 23, 2017 – Jan. 20, 2018), in Downtown Berkeley’s vibrant art district. My painting Colony depicted a roughly sketched tight grid, in which several skeletal ants nervously roam around these low barriers. 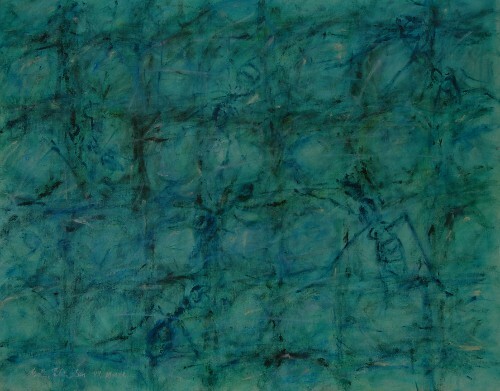 The whole painting was awash in a cold and almost sinister bluish green, and the insects were barely discernible at the first glance, as they seemed to have merged with the thin grids underneath their wiry bodies. The painting was a bit starling as it presented the ants in close-up, and they looked rather monstrous in their enormities. This painting is currently in a Group exhibition Color Speaks (Sep. 23, 2017 – Jan. 20, 2018), in the vibrant art district of Downtown Berkeley.